Vote to Levitt AMP [Your City]! Every summer, free Levitt concerts reach over 500,000 people in six cities across the country: Memphis, Arlington, Los Angeles, Pasadena, Westport and Bethlehem. Seeking to increase our impact even more, we’re spreading the power of arts and creative placemaking beyond major metro areas to places of all sizes. The Levitt AMP [Your City] Grant Awards is an exciting new matching grant program that will award up to $25K each to small and mid-sized cities. In 2015, grantees will produce their own Levitt AMP [Your City] Music Series, extending the reach of free, live music by an additional 100 free concerts. The application phase has now ended, and reflecting our mission that all Levitt projects be community-driven, we’ve opened up the grant selection process for your votes! Now through November 30 11:59 PM PST, public online voting will help choose the Top 20 Finalists, which will then be narrowed down to 10 final grant recipients by Levitt Pavilions. 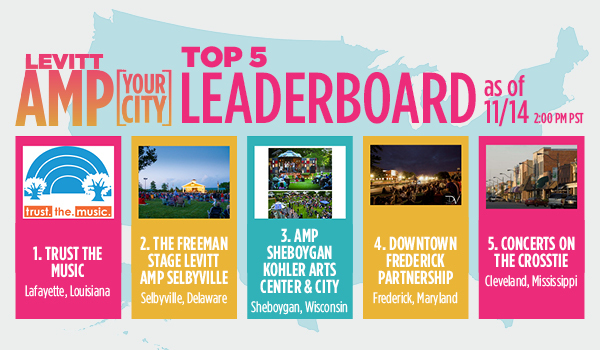 “The summer concert series promises to be the infusion of energy and excitement that downtown Sheboygan needs and the community wants to see,” said Amy Horst, Deputy Director for Programing of the Kohler Arts Center. 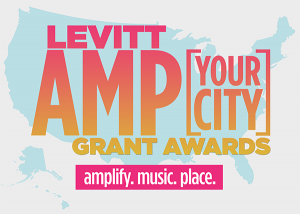 If you haven’t already, sign up to vote for your favorite Levitt AMP [Your City] Grant Awards proposal! Individual voters can vote for up to five different submissions, but can only vote for each submission once. Winners will be announced December 15, so stay tuned! This entry was posted in Levitt AMP, Levitt in America, News, Placemaking on November 14, 2014 by Katie Huang.